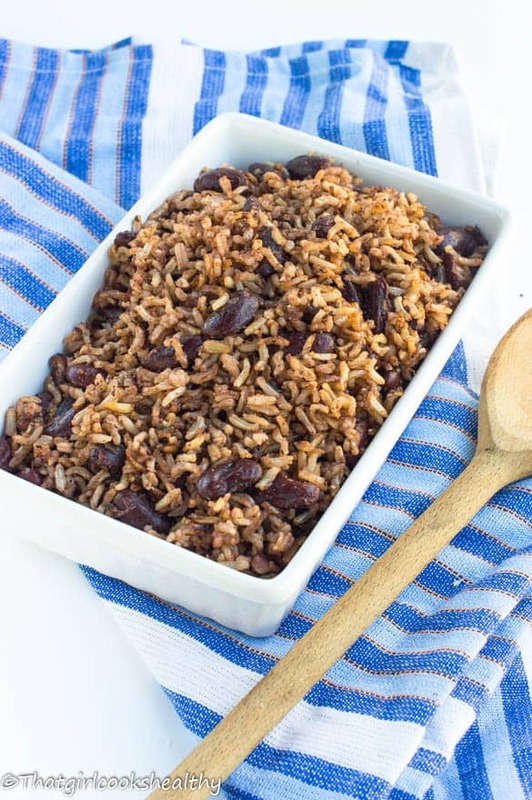 Jamaican rice and peas recipe – Sunday dinner wouldn’t be the same without some Jamaican rice an peas (kidney beans) made with coconut milk and seasoning. Jamaican rice and peas are an absolute staple within most households. Infact not just Jamaicans but the entire English Caribbean region indulges in this staple dish. Rice and peas aka peas and rice or moros y cristianos are essentially beans, though in the Caribbean especially among the English speaking islands, you’ll find different variants of beans referred to as ‘peas’. Don’t ask me why Island people refer to beans as peas it’s simply a cultural custom norm which people abide by without questioning. Interestingly enough, the dish itself derives from a Ghanaian cuisine called Waakye, where beans and rice are boiled together, omitting the condiments. 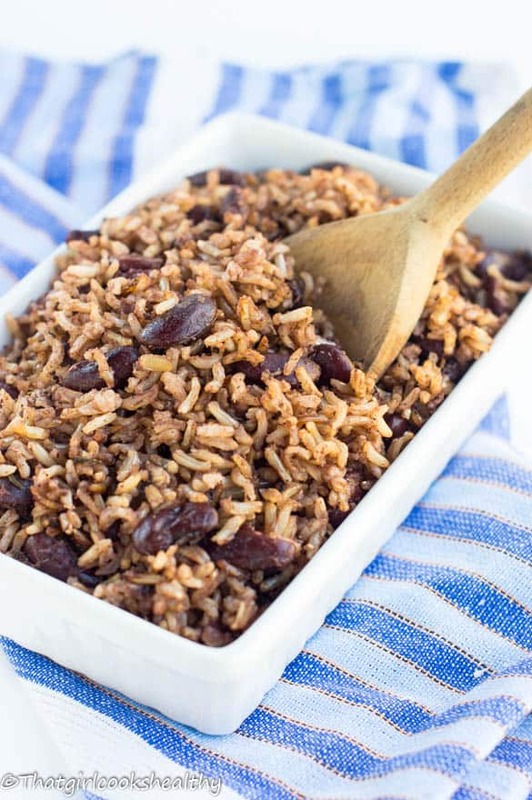 Each Caribbean island has their own prized adaptation of rice and peas, don’t be alarmed if the recipe varies according to each island or even household. I’ve travelled to various Caribbean islands and to be honest with you, the recipe tastes identical to how my grandmother and mother made/taught me how to do it. I think Cuba was probably a stark contrast since they seasoned their rice with cumin, bell peppers, oregano and simmered the rice in water rather than water and coconut milk. Aside from that, it tasted flavoursome, though I did have to ask the lady who was serving me to leave out the pork, another addition to the dish. Traditionally you’ll find most people from Caribbean backgrounds eating rice and peas on a Sunday, for dinner usually when church was officially over. There’s no limitations to eating this on a Sunday only, you can eat this any day of the week, however Sunday is the cultural norm. Living in the diaspora has seen a change in eating habits with people from Caribbean lineage (mainly 2nd -3rd generations) eating more western foods and shunning their traditional food. Growing up for us, there was no arguing or debate for that matter, you’d eat what was prepared and be grateful. We ALWAYS used dried kidney beans instead of canned beans because it was cost effective and we weren’t in a rush to cook. In all, it took almost 2 days to cook the dish since we’d soak the peas overnight – stage 1 and follow up with boiling and simmering the pot the next day. This recipe uses the old method of cooking rice and peas – using dried beans. I rarely use canned beans unless I’m extremely busy, I’d much rather follow in my grandmother and mothers foot steps by using their method of slow cooking, it’s more intimate albeit longer. I think because the women were seen as the nurturers they had more time to dedicate to cooking which explains why dried beans were probably a preference. 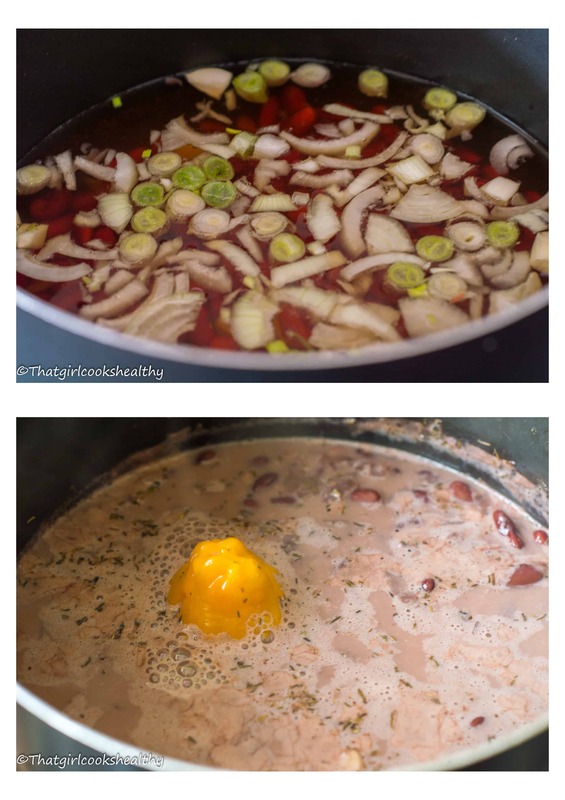 Can I use canned beans instead of dried kidney beans? Yes, you can of course used canned beans, with that being said, the water levels will change, as I used quite a bit of water to compensate the absorption levels of the peas and brown rice. The beans will need to soak overnight to soften and exude a dark hue – rinse the peas several times prior to soaking. Overall, this may seem challenging for a novice BUT it’s really not that difficult once you master the ratio of water or dried goods. It took me awhile to do so myself namely because the women in my family used white rice which you know is processed and has no place on my blog. The brown rice gives a mild nutty taste, nothing that overpowers/ dulls the taste it’s very complimentary and of course brown rice is full of fibre. It’s ability to expand and act as a internal sweeper, cleaning up the waste and expelling it from the body is remarkable, for some the slow breaking down mechanism can cause digestive problems/sensitivities….therefore sprouted grains are also a good digestive friendly choice to substitute with. 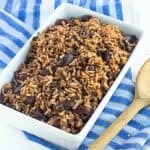 Is it possible to make Jamaican rice and peas without coconut milk? Yes, you can omit the use of coconut milk if you want BUT….this wouldn’t be in line with the traditional way of making it. Coconut milk is an essential ingredient for authenticity. Some people use a block of coconut cream instead but if coconut in general is a problem then you may make it with water alone. There’s is no substitute for coconut milk that will yield the same results. Why did my rice and peas look so pale? I see so many recipes that misrepresent Caribbean/Jamaica rice and peas with a pale or washed out look. The reason for this is because SO many people throw away the water that is used to soak the “peas”. When leaving your kidney beans to soak overnight DO NOT THROW THAT WATER AWAY. That water is like liquid gold to your recipe, you need it for colour. Once tossed out this step is irreversible until you decide to soak more peas. Why did my rice and peas turn out soft and/or mushy? You used too much water or added too much water to the pot. You can remedy soft rice by leaving the pot to cook away on the stove uncovered so the excess moisture evaporates or transfer the rice into a ovenproof dish and baking off the additional water. If you do find yourself having to add more water ALWAYS add a little at a time. What can I serve rice and peas with? Bring the peas in water with the garlic, onion and scallion to the boil and reduce to medium. Cover the saucepan with the lid and simmer for 1hr – 1hr 15 minutes – check the water levels throughout this time as it will have reduced by half, anything lower than that add a cup of hot water. Check the readiness of the peas by using a slotted spoon to remove a few and mashing them. If they mash with ease, they are ready for the next step. Add the coconut milk and continue to simmer for a further 10 minutes before adding the rice, thyme, scotch bonnet, pink salt, ginger and pimento and stir. Allow to slowly simmer for 40-45 minutes, low-medium heat check frequently to ensure the rice doesn’t burn and absorption levels. After 45 minutes the rice should be soft, fluffy (not sticky). I’m a strong advocate for dry beans instead of canned also. 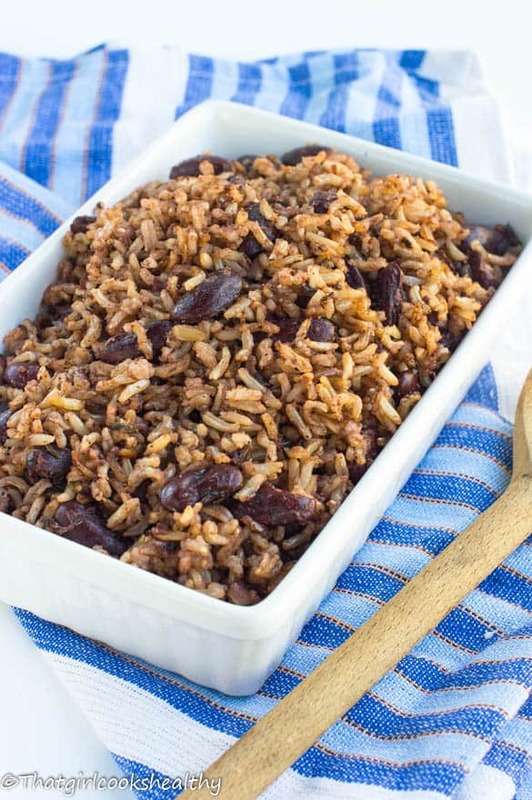 I was remarking on another blog (uncommon Caribbean) just the other day about some of this topic – that it’s interesting that each country in the tropics has their own twist on rice & peas; I’m partial to pelau, but will try making this Jamaican version one day. I hope you do give this a try one day, I’m sure you will like it and yes dried legumes are far more cost effective in the long haul. I cannot wait to try out paleu rice, watch this space! Sadly the town i live in is dated where food is concerned so getting the peas is hard so I’ve had to resort to the tinned ☹ but I’m wondering how i cook the rice using these thanks. Don’t panic it’s still doable, but the instructions I gave for this recipe are specifically for dried peas. However, when using canned peas, you need to change things up a little. First of all you’ll need about 3 cups of water in total. The first step would be to bring the water combined with the coconut milk to the boil, so we add the coconut milk in the first steps instead. then add your peas (with the liquid from the can) scallion, garlic, onion, scotch bonnet, ginger, pink salt etc.. and then you finally stir your rice. So you only adaption to the recipe is adding the coconut milk in with the first step and scaling back the amount of liquid being used because the peas are already cooked. I hope that makes sense, if you need anymore help I’m more than happy to assist. Thanks for the recipe it sounds amazing and i LOVE rice and pea! Hi Amy, There’s no such thing as a silly question. I’m here to help and offer you any clarity. You need to retain the water that you soak the peas in overnight. Do not discard the water as this this required to give rice (once cooked) that red hue that you see in rice and peas. What you need to do is rinse the peas several times prior to finally soaking overnight. Rinsing before soaking will thoroghly remove any particles and/or debris. I hope that makes sense and feel free to message me again if you have anymore questions. O my God. I am so excited. Hi my name is Yolanda. I have a 96 yr old client who asked if I would incorporate Jamaican dishes once a week. I had such a great time with her today looking up different recipes. This is one of her request. Alson Curry Goat and Ceviche dish. Do you have any recipes for those as well? Hi there, I’m glad to be of assistance to you and your client. I am currently working on a Caribbean cookbook where I will be including those recipes. In the meantime please feel free to browse my recipes and don’t be afraid to ask for help. Hi Fre’na. I’m glad that you like Jamaican food. I do have a recipe for oxtail and cabbage, however I am currently working on a cookbook where those recipes will be included in my upcoming book. I’m very excited to try ur recipe of rice & peas. My husband loves loves Jamaican food and unfortunately I don’t cook it, aside from coconut rice & beans, which he enjoys every much. I will follow recipe to the T & let u know how it goes. Thanks p.s. when is ur cook book coming out & what is the title ? Hi Traci. Oh awesome, please let me know if you need any assistance with the recipe. I’m currently working on the manuscript for my book which I’m hoping to release summer 2017. I haven’t confirmed the name of the book as of yet but please make sure to follow me via social media to stay up to date with recipes, new releases. As promised, I made the rice and peas recipe for my New Year’s dinner (along with the stewed chicken). Glad you enjoyed the recipe. The dried kidney beans are soooo much more tastier aren’t they? Hi Emma, Yes sure! I’m more than happy to help. It sounds are if you’ve used too much water as the rice should be firm and subtly soft. Are you following my recipe or are you simply just experiencing problems with making rice and peas in general? So when I made this dish I followed the recipe but still ended up with a mushy result like when I have tried rice and peas in the past. I think the problem was the pea liquid did not reduce by anywhere close to half like in the recipe. I’m wondering what I may be doing wrong that I am not getting that fluffy delicious looking rice like in your picture lol? Hi Russell. Sorry to learn that the texture wasn’t as per picture. I have made this recipe many times with you problems. I would suggest next time scaling back on the cups of water in the initial stages, so eliminate 2 cups to begin with while the peas are boiling. When you it comes to adding the rice, coconut milk etc… let the everything cook and if it seems dry then add 1/4 cup until it’s fluffy. What are pimento balls? Are they pimento cheese balls? Pimento berries is another term for allspice. It’s a spice with a flavour and aroma consisting of cloves, nutmeg, cinnamon and pepper combined into one.It’s not a key ingredient but it does add a hint of warm flavour. Hi Charla, thanks for sharing this recipe ☺ will definitely try this out. In north India we also serve red kidney beans with rice (rajma chawal) – a staple. But adding coconut milk is a wonderful new twist to this staple! Looking forward to making this. Thanks Arpita. I hope you enjoy the recipe and let me know if you need any further assistance. Been trying to make authentic tasting rice n pea at home for ages – but always end up with a tasty, but always sticky and gloopy rice. This is the first rice I made which has stayed fluffy and light and delicious so thank you! Aww I’m so glad you liked the recipe AJ. Thank you so much for the feedback!! Hi Shakia. I don’t recall what brand of brown rice I use as I store what I have in a large container which lasts for months. In terms of coconut milk I’m a huge fan of biona full fat coconut milk. Hello i want to make this using canned beans but i am a little confused. Do i use 1 whole xan of beans or just 3/4 cup, also I’m confused on the amount of coconut milk to use. Is it 1 cup canned coconut milk or 1 full can? Hi Akilah. Use one whole can since you are using cooked beans. Don’t throw away the water from the beans as you need it to darken the rice. One cup of coconut milk is suffice. I have just updated the recipe card to clarity what I mean. My apologies!! Hello, how may portions does this serve ? Hi Amanda. serves roughly 6 people. Enjoy!